When you start a mammoth undertaking you really want it to go without a hitch; at least at the beginning. The beginning of our walk around the coast of Britain started at Great Wakering, on land owned by the MoD. So when I drove through a restricted access barrier, which was raised to let a car going through in the opposite direction, and when the guard rushed out of the guard house to come after me, it wasn’t the best start we could have wished for. I got out of my car and said a good morning to him in my friendliest and heartiest voice. I explained that I wasn’t sure what I was supposed to do about gaining access to the land behind the barrier I had just driven through. The guard very patiently explained that an A4 sheet of instructions was taped on the barrier which had just been raised, for the benefit of people like me. Of course these instructions were now twenty feet in the air, sideways on, and unreadable. I decided not to make that point, but simply apologised. With continued and practiced patience, he said that it was alright. I asked him if we could drive on, and he said that would be fine. As I walked back to my car he was probably thinking it was a good thing that I was not with the MoD; and that the safety of the country was not in the hands of such a bumbling idiot who didn’t know how to stop at barriers or read small writing sideways on sheets of paper suspended twenty feet in the air. And so we drove to Wakering Stairs. The Wakering Stairs are located just to the south of Foulness Island in Essex, about 5½ miles east and slightly north of Southend-on-Sea. It was here that we decided our walk around the coast of Britain should begin. Why? Because we had originally decided to start at the easternmost tip of Foulness Island, but then found out that the entire island was owned by the MoD and virtually impenetrable. Best start a few miles south, we thought. If you search for Wakering Stairs on Google Earth it will take you to Stairs Road in Great Wakering. Follow that road to the coast, and that’s where we started. The area lies within the Shoeburyness New Ranges, and during the week the land is used for testing artillery shells and the like. On Sundays, however, the shelling stops and the area is open for the public to enter and wander over public rights of way that exist around the coastline, and indeed out on the Maplin Sands. 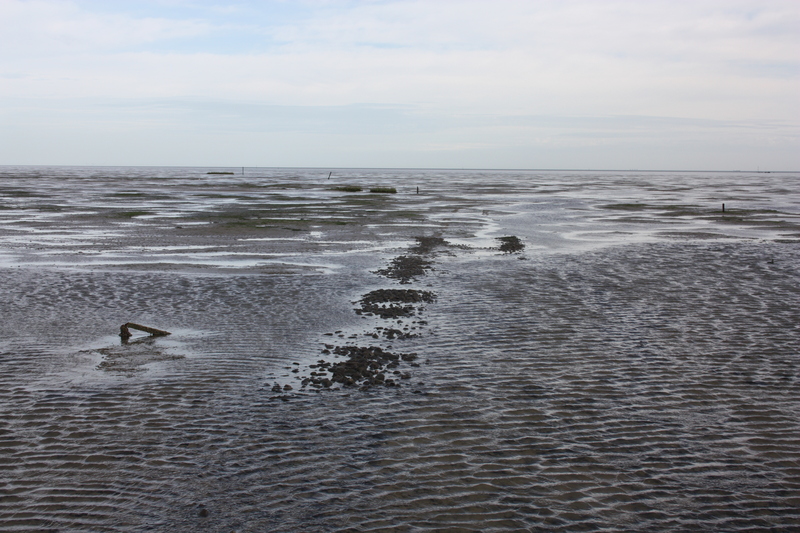 The Maplin Sands is the name given to the enormous expanse of mudflats around this part of the coast. 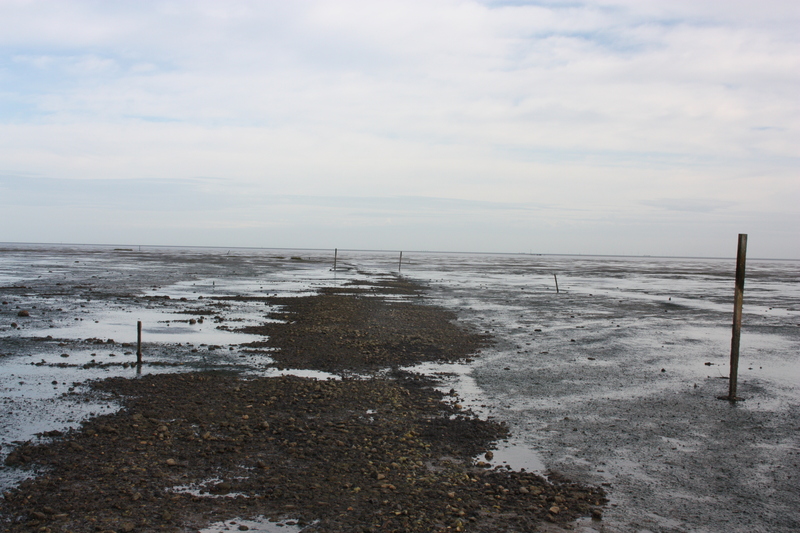 A century ago, before any bridges to Foulness Island existed, the only way to the island was at low tide, over the Sands. This route was (and is) known as The Broomway, and it is one of the most treacherous coastal paths there is. The Broomway is designated as a “Danger Area” on the Ordnance Survey Map. It runs about 6 miles across the Maplin Sands to Fisherman’s Head on Foulness. Whilst it appears on Ordance Survey maps as a bold green footpath, a byway even and open to all traffic, any search for information about it reveals first and foremost that it is just plain dangerous. The path is underwater for three hours either side of the high tide, and the tides do not necessarily follow the timings found on the tide charts. The flatness of the area means that low pressure and wind can change the turn of the tide by a noticeable margin. 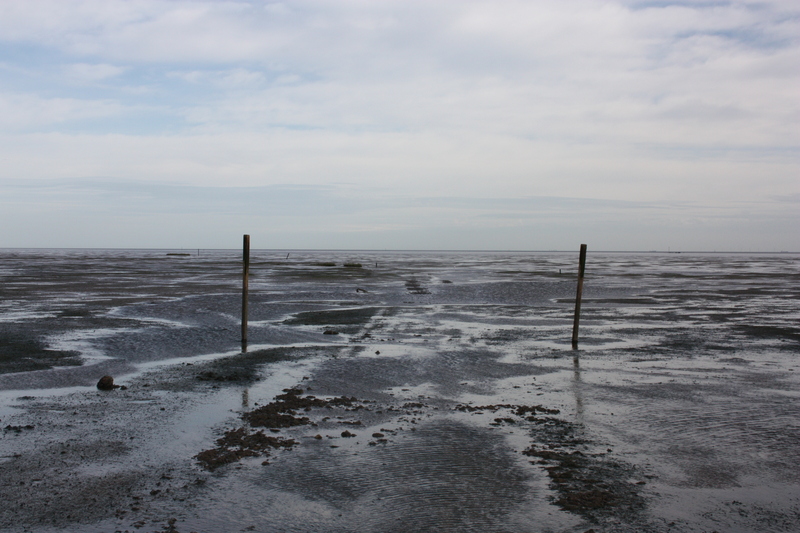 Although The Broomway itself is firmish underfoot, to either side of it is soft sand and mud. Some of this mud is unexpectedly soft, and it has been known to pull people under. Near Shelford Head, in the middle of The Broomway, old books refer to a hole in the sands known variously as Snagsby’s Edge or Shagsby’s Hole. This spot is where a man of that name perished in the sand. The tidal waters can come in faster than a man can run. Because of the flatness of the land and the effect of the slight undulations in the sands, tidal waters can swirl around and come in from any direction, or indeed several directions at once. The flow of the tide can therefore block any way back to land. As the waters meet from their different directions, whirlpools are created, and meanwhile sea mists can form out of nowhere, disorienting those caught and trying to escape the tide. These mists cause virtual whiteouts, so that after turning around a few times all sense of direction is lost. Many people, both local and visitors, are reported to have lost their lives on The Broomway as they struggled to escape the tidal waters. It is said that the local parish registers mention many who have drowned, having lost their way or misjudged the path. If that wasn’t enough, because The Broomway now falls within Ministry of Defence land and the firing ranges of Foulness, artillery shells and all manner of explosives are said to be strewn across the mudflats, so if you don’t drown, and if you manage to escape the quicksand, you will surely be blown up! The origin of The Broomway is unknown, as is its age. It was first documented in 1419, but may well date back to Roman or even Saxon times. It is unknown whether it is a man-made feature or if it formed naturally, although some of its southern section has been overlaid with concrete and/or cobblestones so as to give it a surface. These soon run out, however, at which point The Broomway’s surface is the sand itself. Books recommend that two hours is given from when the tide goes out before journeying out along it, in order to allow the sands to dry out, but even then some of the route can be under a small amount of water. The most critical point is Havengore Creek, close to the southern end of the route. Here, a shallow river snakes over the sands and has to be crossed. It should be no deeper than six inches, but if it is, it could be a warning that the tide is coming in earlier than anticipated. The Ordnance Survey maps show various offshoots from the path, running off The Broomway and back to land. Over the years there have been many of these, known as headways, and they afford the traveller a route back to safety in an emergency. They were built across the soft mud near the shoreline, linking up with local farms. However, many headways have come and gone over the years, and the marked paths on the maps are usually impassable and dangerous. “Of the brooms there are nearly 400; they are placed 30 yards apart, and are sunk two feet into the sand. Every year they are renewed; but it is necessary to repair many of them at shorter intervals”. 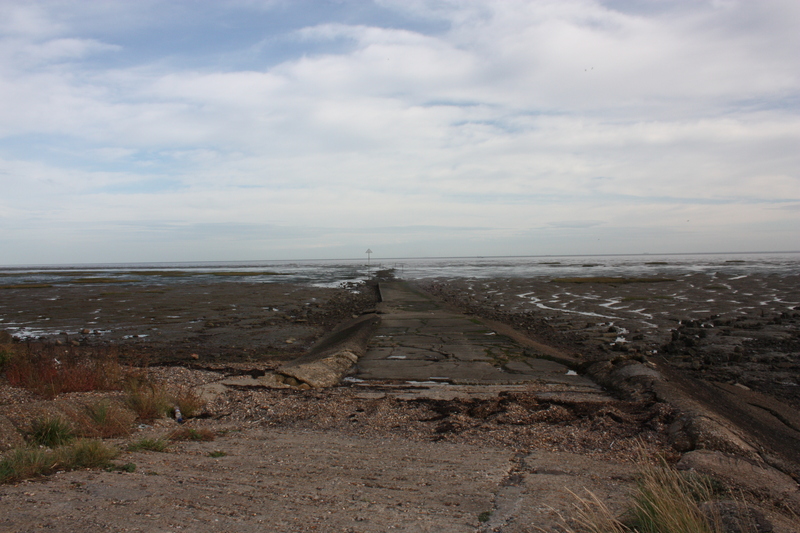 The Broomway used to be the only way across to Foulness Island until a bridge was built in 1926; the postman with his horse and cart used to have to use the route to deliver mail. For safety he used to follow the tide out, and he took a companion if it was misty, in order to help with navigation. Once the bridge was built The Broomway fell into disuse. Today there are few markers left, and the twigs are all long gone. Travellers across The Broomway today will still see wooden posts, driven into the ground and running in a line. However, these are more likely to be range markers for the artillery on Foulness Island, and do not follow the path of The Broomway at all. To follow them would be perilous. There are guided tours which can be found on the internet, run by experienced locals. The OS Map presents a clear warning to travellers: “Public Rights of Way across Maplin Sands can be dangerous. Seek local guidance”. Suffice to say that we were not going to walk The Broomway today, though I was hoping to get out on to at least the first section. However, when we arrived it was high tide. We could walk for fifty yards or so along the concrete start, but that was it. Much later in the day, though, after we finished our walk and got back to the car, the tide had gone out. We were able to explore The Broomway a bit further. We walked out. The concrete soon came to an end. After another hundred yards or so, the cobbles themselves began to disappear. Until finally, we were left to pick our way across the sands, navigating rivulets of water channels. We lasted about 10 feet, before grinding to a halt and deciding to go no further. 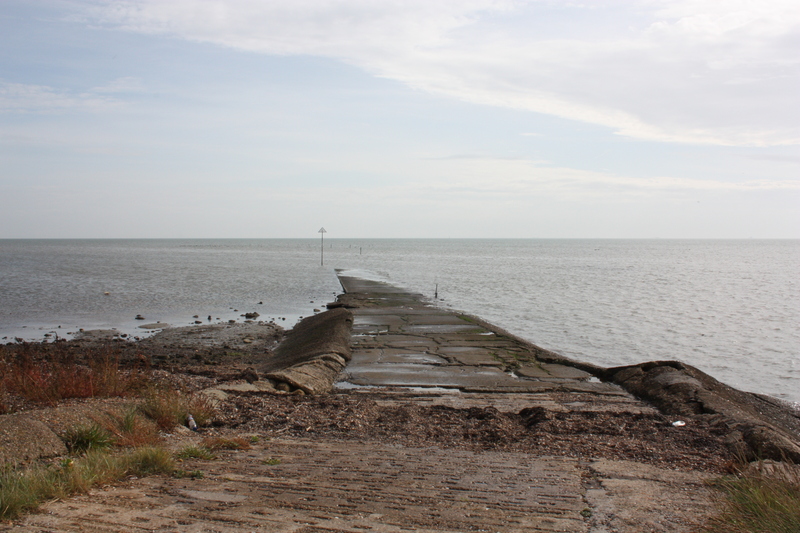 This entry was posted in Essex and tagged Broomway, coast, Essex, travel, Wakering, walking. Bookmark the permalink. Very helpful. A group of us are walking the Essex Coast, and considering The Broomway. I think we might give it a miss! Very good description of the walk in a book called “The Old ways” by Robert Macfarlane. Still don’t fancy it though. Hi and thanks for your comment. I quite fancy the guided walks which I think run a couple of times a year, but I wouldn’t want to attempt it on my own. The Robert MAcfarlane book was publicised recently and as a result the hits to this website went up by about 500% overnight as people Googled the Broomway – I was very grateful to him! And thank you for your like and for following. You won’t believe what I am about to tell you but it’s true, I drove the broom way as far as rug wood point then lost all hope of following a route back inland and turned around, back to the start, with the tide following! It was a horrendous experience that I never want to repeat! I’ve read that people have driven along The Broomway – I seem to recall there’s a Youtube video of some people on motorbikes doing it. I’d be worried about losing my way and sinking into the sand! I’m gald you got back to tell the tale and thanks for sharing it! Thanks Pat! I never knew that! I went on one of the guided walks over the Broomway last weekend. I would certainly recommend it. We walked from Wakering Stairs to Asplins Head over the Broomway. No one blew up or sunk into the sand or mud. Once on the island there was an included tractor tour taking in the two villages, thw quay, Fishermans Head and many of the rights of way and some of the normally private roads, so you do get to see most of the public “accessible” parts of the island. Wonderful! I’ve seen these tours advertised and intend to go one day. At the moment we’ve been concentrating on getting more coastal miles under our belts because we can get down and back in a day, but those days are coming to an end. Once we are restricted to school holidays we’ll be looking at walks like the Broomway. Thanks for the recommendation! Don’t be daft. MOD would have forcibly closed the Broomway decades ago if there were any undetonated explosives on an open public right of way. Their liability would be immense. People walk the Broomway all the time without consequence. The only danger is that, unlike most public matters in our litigious society, it is not crafted to be as “idiot proof”, as, say, EuroDisney, and thus retains the possibility of self-extinction if one is foolish, ill-informed and heedless. You’re 1000 times more likely to be killed on the M4, yet anybody who was to make a blog post announcing that they were too frightened to use the motorways would be (rightfully) mocked as a dysfunctional phobic. Wow! Thank you for your damning comment and I am sorry you thought my words represented the literal truth. They were not meant to. For what it’s worth I agree with what you say. Just not the way you say it.